Where the distance exceeds 600 M, it is generally recommended to use Mercator sailing so that results are more accurate results obtained. To get DMP, apply same rule as for D’Lat i.e, same names subtract, different names add. 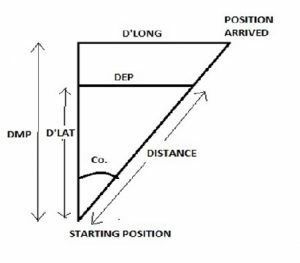 To get distance, use plane sailing formula. In order to understand and solve such questions in a better and easy way, one must always draw the diagram. Thank you for your usefull solution but what are those numbers under latitudes which you add and subtract them to find DMP?